One of Dürer's supreme masterpieces is his 1514 engraving of St. Jerome in his study (Bartsch 60, Strauss 77, Meder 59). Original engraving, 1514. We, alas, have no impression of this wonderful piece, which Vasari describes as part of his discussion of Dürer's prints in his chapter on Marcantonio Raimondi in the second edition of The Lives of the Painters, Sculptors and Architects (1568): "And finally he published St. Jerome in a Cardinal's garb, writing with a sleeping lion at his feet. Dürer depicts a room with glass windows through which the sun is shining and reflected in so natural a manner that one is utterly astonished. Furthermore there are books, an hourglass, writings, and many other things which could be neither rendered in in greater abundance nor more skillfully" (p. 212). 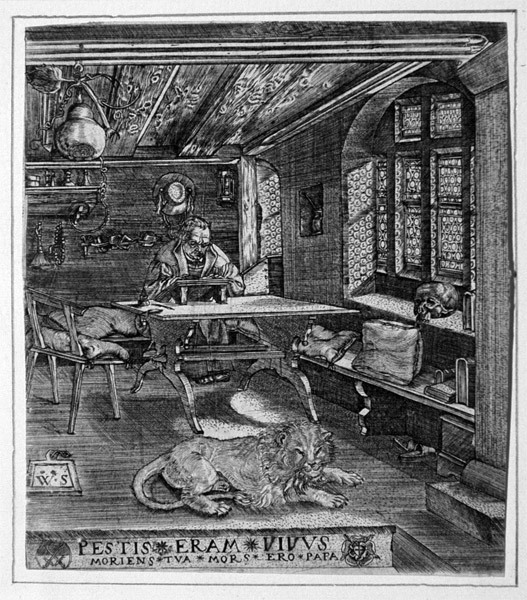 Monogrammistg W. S., Martin Luther as St. Jerome in his study (B. 1 i/ii). Engraving after Dürer, c. 1546. When Luther died, an engraving, reversed and smaller in size than Dürer's St. Jerome in his study (Image size: 247x188mm), was published by an artist who signed himself "W.S.," who has sometimes been identified (probably incorrectly) with Wolfgang Stuber, a German artist active c. 1580--1588. In the first state of the print, the word "VIVVS" in the inscription was misspelled "FIFVS," and changed by hand to "VIVVS." In the second state, it was corrected to "VIVVS." Our impression is from the first (presumably very small) printing. On their website, the British Museum suggests that the print may have been published in 1546, the year in which Luther died, to mark this new stage in his war against Roman Catholicism. The inscription reads, "O pope, while I was alive I was a pest to you; once I am dead I shall be your death." An image of the second state of the engraving is published in Christiane Andersson and Charles Talbot, From A Mighty Fortress: Prints, Drawings, and Books in the Age of Luther 1483-1586 (Detroit: Detroit Institute of Arts, 1983), p. 34. In Dürer's engraving, there is a small crucifix on the right hand corner of the desk, the windows are on the left side of the print, and there is a sleeping dog lying on the floor next to the sleeping lion. The substitution of Luther for St. Jerome is appropriate: St. Jerome gave us the Latin translation of the Old and New Testaments that was accepted in the Catholic Church through the 16th century; Luther's German translation (in itself a forbidden act) immediately became the standard bible in the German-speaking parts of the world and Luther is often credited as the father of German literature. The works of Monogrammist W.S. will be catalogued in The Illustrated Bartsch, vol. 22. Very rare in this first state! Image size: 141x121mm (slightly trimmed on the left side). Price: $5000.